The reason that family unity and prosperity seldom survive three generations is that heirs are usually not prepared to receive both their financial and their emotional inheritances. There actually is a ‘formula’ for sustaining wealth and family unity from one generation to the next. 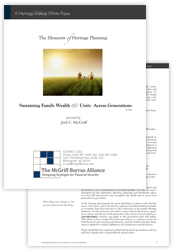 Families who thrive and prosper across generations prepare their heirs using the elements described in this white paper. Enter your information below to download your free white paper!